Panya Yingang, the confessed mastermind behind the killing of a former Phuket coyote dancer and her childhood friend at Sattahip’s Buddha Mountain, says the teenager reneged on a promise to marry him after he gave her 7 million baht. The confessed mastermind behind the killing of a former Phuket coyote dancer and her childhood friend at Sattahip’s Buddha Mountain says the teenager reneged on a promise to marry him after he gave her 7 million baht. Acknowledging the murder and weapons charges against him at the Pattaya Provincial Court Aug. 22, Phuket bar owner Panya Yingang, 39, confessed he killed 20-year-old Paveena Namuangrak and Anantachai Jaritrum, 21, in a jealousy-fueled rage and that had he suspected anyone else had helped her betray him, they would have been killed, too. The young woman from Kalasin had come to Pattaya with school mate and co-worker Anantachai, another friend, and Panya’s associate Sayan Srisuk, 43, to celebrate her 20th birthday July 29. After visiting the Pattaya Floating Market and Nong Nooch Tropical Garden, they made the fateful stop at Khao Chee Chan to make merit at the 130-meter-tall Buddha image laser-carved into the side of the mountain. According to the final police re-enactment of the slayings Aug. 21, Paveena and Anantachai were confronted by Panya and Narong Warintarawej, who opened fire using three guns. Despite multiple misfires, the gunmen shot both dead with shots to the head and back. The slayings have shocked Najomtien Sub-district and fans of Buddha Mountain, who are horrified at the soiling of the scared place. More than 100 police officers and volunteers were needed to keep angry mobs at bay for Panya’s re-enactment. Panya, whose nickname is “Mr. Fat Bangla”, for the road where he owns multiple bars in Phuket’s nightlife district, claimed he was in love with the girl who came to work at his Pum Pui go-go bar when she was just 17. Her family has said he made repeated romantic overtures to her over the coming year, which she rebuffed. After Panya reportedly assaulted her in public last year she left Phuket and went to work with Anantachai as a waitress in a Nakhon Sawan restaurant. Paveena’s mother told Thai media that Panya persisted, even sending her 1 million baht over the family’s objections. Panya claimed it actually was seven million and, in return, she agreed to marry him. She didn’t, of course, and an enraged Panya vowed revenge. He said at his court hearing that it was then he decided to kill her so she could be “judged after death” for her betrayal. He had Anantachai killed because he wrongly believed he was Paveena’s boyfriend. In fact, the youth was gay and had even taken to borrowing Paveena’s clothes. In hindsight, Panya said, he wanted to apologize to the victims’ families, although both told Thai media earlier they would never forgive him. 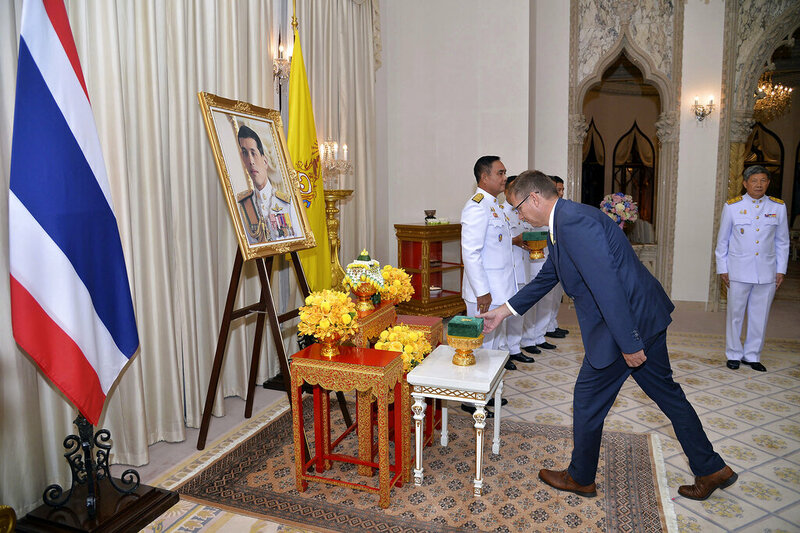 Panya also dropped to his knees at Khao Chee Chan, prostrating himself in front of the Buddha for disrespecting him. The defendant believes the guns misfired because of the sacrilege of the crime. 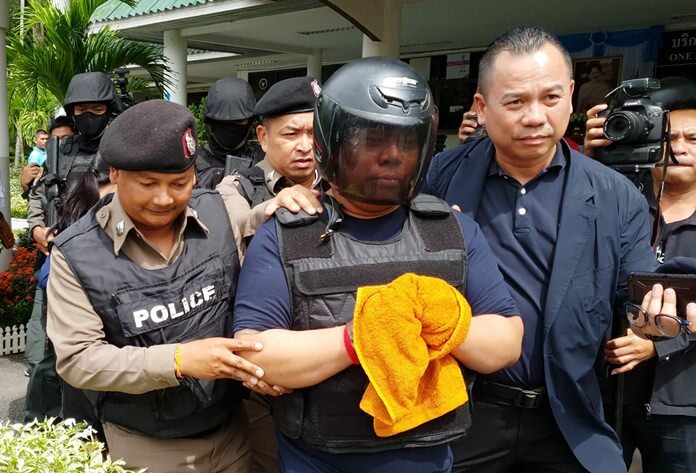 After facing the charges for conspiracy to commit murder, illegal possession of a gun and bullets, and carrying a gun in public, Panya was remanded to custody at Pattaya Remand Prison to face trial.